A farmer, a restaurant owner, a labor supporter and a public-health community advocate walk into a room over a bar… and they’re greeted like rock stars by a sold-out crowd. This was the scene at the Swedish American Hall on Monday night, August 15, when San Francisco’s Commonwealth Club presented Women Leaders at the Table: Addressing Inequity in the Good Food Movement. 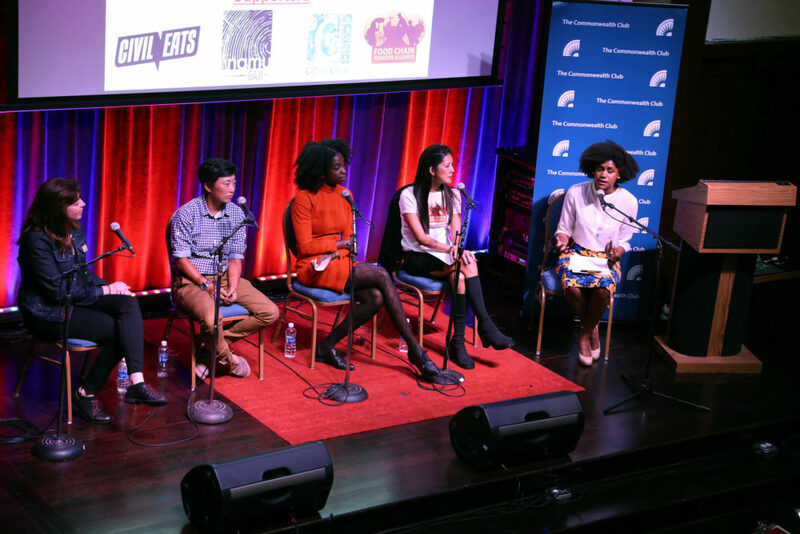 When Cathy Curtis, the organizer of the Commonwealth Club’s Food Matters program (formerly Bay Gourmet), began to put together a panel of women of color to address issues of inequity and race in the good-food movement, she had no idea it would draw such a crowd. Initially, the panel was set to take place in a small meeting room within the club, but once posted, the event sold out almost immediately, and Curtis and the panel’s moderator, Shakirah Simley, were flooded with emails begging them to shift the event to a larger venue. After a last-minute scramble, the Ne Timeas restaurant group, which owns Aatxe in the Swedish American Hall (as well as Cafe du Nord next door), offered free use of the hall’s large meeting room upstairs. Civil Eats offered media support; CUESA pulled in volunteers; Bi-Rite Market donated wine and sandwiches for the post-meeting reception. This article originally appeared on KQED Food. Photographs by Wendy Goodfriend.